NOT A RITUAL. NOT A WORD. THE MOST CHARGED PIECE OF MAGICKAL INFORMATION IN PRINT! It’s in the Bible – or at least in some translations of it – but only the initiated know its meaning. EVERYTHING YOU DESIRE CAN BE YOURS WHEN YOU USE THIS FORMULA. Translated from the original texts the formula means the ‘Hand of God’. ‘EVERYTHING BASIC IN THIS PHYSICAL WORLD IS SUBJECT TO THE SACRED POWER OF THIS FORMULA. According to him, it was the bedrock of every magickal operation. USE THIS FORMULA AND YOU ARE ASSURED SUCCESS. You need no previous experience. You only need to learn this formula. Learn and use it and everything you seek will be within your grasp. God'’s hand will open to you. But who and what is ‘God’? This you need not concern yourself with. You need only concern yourself with learning the formula. And you can put it into practice within half an hour of reading this booklet. I repeat: suddenly whatever you want will be within your grasp. This formula is derived from secret knowledge known only to initiates. It is not new: but it is largely unknown. Most people who read the Bible have no idea of its existence! 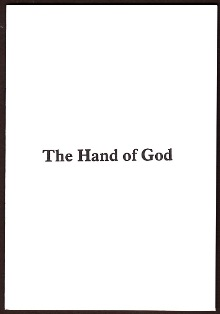 But it is there, and it is called the ‘Hand of God’ for a perfectly good reason. MY PUBLICATION IS PROBABLY THE ONLY ONE ANYWHERE EXPLAINING IT IN FULL. Magick can be a complex business. Sometimes it works, other times one can lose faith. I DO NOT HAVE TO WORRY. I INVOKE THE ‘HAND OF GOD’. I got the woman I wanted with this formula. I am not rich, for I don't care for material things. I am not a businessman. But when I need money I receive it. With the Hand of God I am always provided for. IT NEVER, EVER, FAILS ME. What is important to me is good health. I believe that all the health problems I had – and I was a sickly child – disappeared because of the ‘Hand of God’. I find it easy to ‘believe’ when the results are always apparent. BUT THE POINT IS: WHATEVER YOU SEEK OR DESIRE IN THIS WORLD CAN BE YOURS. IT CAN BE AUTOMATICALLY YOURS. Only the ‘Hand of God can do this. YOU DO NOT HAVE TO BE OF A RELIGIOUS FRAME OF MIND. You are not asked to believe in the God of the church. Ever since the scriptures were written they possessed a secret, inner meaning. This meaning is rooted in the magick of ancient Egypt. The stories people believe in the Bible were written for the public, their true significance concealed. All you need for this formula to work is to follow the instructions carefully (not difficult). Think of the thing you most want now.... You can have it: it is within your grasp. But how so? It is not necessary for you to understand, you only have to do it. The ‘Hand of God’ is not a mere concept or metaphor. It has been here since the beginning of time. I didn'’t discover it; I was lucky to be taught by a wise one. I REALIZE NOW THAT WHAT IS CONCEALED IN THE BIBLE – AS OPPOSED TO WHAT IS OPENLY REVEALED – CONTAINS THE METAPHYSICAL SECRETS OF THE UNIVERSE AND THE SECRET OF PHYSICAL MATTER ITSELF. You only need to know this formula to access this concealed wisdom. So few people until now have known about it because of its deliberate concealment. THOSE WITH EYES OPEN, HANDS HELD OUT, THOSE WHO DESIRE – IT IS THEY WHO CAN RECEIVE THIS CONCEALED WISDOM. Everything you need to know is explained in my monograph. You don’t need anything else. No candles, rituals, etc. You don’t need to pray. You don’t need to study the Bible; everything you need is in my monograph. This is based on something eternal and unchanging. I see myself only as a messenger. Open yourself to this message. Experience the Hand of God. Experience the power of real magick. Real magick is the art and practice of creating material events by the invocation of esoteric power. As best I know, this information is at present available nowhere else. So, to some extent it still remains hidden. You don’t need positive thinking. You need only to accept the formula and put it into practice. Tell no one what you are doing. THINK AGAIN ABOUT WHAT YOU MOST WANT. This formula is the one thing that can put it in your grasp. WHAT YOU SEEK CAN BE YOURS: AUTOMATICALLY AND ABSOLUTELY. Within the ‘Hand of God’ lies all creation and everything that is in it. But this is a magickal idea, not a Christian nor a Jewish one. It is an ancient Egyptian concept, found by the Jews in Egypt. The Hand of God cannot fail you. It epitomizes the inexhaustible law of supply. YOUR NEED CAN BE SUPPLIED. YOUR DESIRE CAN BE FULFILLED. YOUR DREAM CAN COME TRUE. Think again seriously about what you most want. A job promotion? The love of another person? The renewed love of someone? Better health? More money? Protection? To get out of trouble? To deal with injustice? THE PROBLEM CAN BE SOLVED, THE NEED CAN BE FULFILLED. This booklet contains not only my monograph on the Hand of God, but also the teachings of the Christian Mysteries of the Rosy Cross which will inspire those fascinated by the ‘hidden’ side of Christianity. But I reiterate: TO USE THIS FORMULA YOU DO NOT HAVE TO BE A ‘BELIEVER’. This is a magickal text, not religious. Open your hand. Open yourself to the power that cannot fail you... Take The Hand of God.